Anti-lost bags, parents can easily know whatever and wherever your kids want to do and go. Offer convenience to you and your babies, some snacks can be put into the bag for your baby during outdoor activity. Cute safety walking backpack, anti-lost mini bag to keep active toddlers colse to you. Have a little explorer on your hands? Its tough to keep them close in crowded places, but the Baby Safety Harness gives you a comfortable way to keep them safe. With attention to detail for the child and caregiver's comfort, the Baby Safety Harness will give you the piece of mind you need! When you are walking at the museum, zoo, fairgrounds, or just out and about with your kids, it is almost impossible to keep them corralled and next to you. This safety harness with leash keeps your toddler near you without a struggle! Keep the things your kid needs right in the bag and give them a feel of being a big kid! And now the little kids get to act like the big kids with their own backpack! 1 x walking safety harness. KIDS CAN'T RUN OFF! - Baby backpack style design with leash for kids safety. It's hard for parents to enjoy themselves in public places when worried about a straying toddler, but this safety harness buckles in the front and safety leash can keep kids close by! 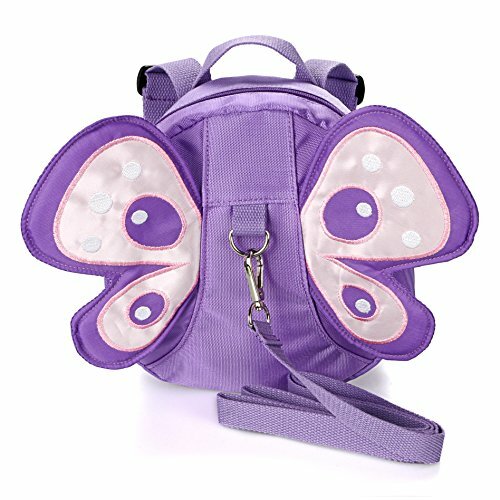 Cute little butterfly design and multifunctional backpack that your child will love to take. It is not just a regular boring harness, it is like your kids becomes a little butterfly flying around. The strap can alse be removed from the bag. LONG DETACHABLE LEASH!-4 foot(1.25M) - Allow your toddlers to move around freely while still having complete control of their direction! Just unhook when dropping off at Childcare or School. MUCH HAPPIER TODDLERS!-Many pre-schoolers just want to feel like a big kid and having a bag their size gives them the impression that they've moved up in the world! HOLDS ALL TODDLER NECESSITIES!-Diapers, wipes, pacifiers, juice cups, toys, cuddle objects, and more can be easily carried in the bag, so less bags that parents have to keep up with! If you have any questions about this product by Hipiwe, contact us by completing and submitting the form below. If you are looking for a specif part number, please include it with your message.